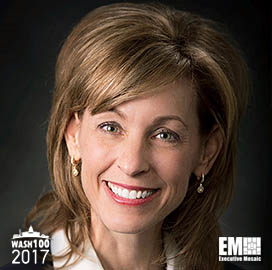 Executive Mosaic is honored to introduce Leanne Caret, president and CEO of Boeing’s defense, space and security segment, as an inductee into the 2017 edition of the Wash100 — Executive Mosaic’s annual selection of influential leaders in the government contracting arena. Caret was promoted to lead the $29 billion BDS segment in February 2016 from her prior role as president of its $9 billion global services and support business unit. In December, Boeing announced plans to transfer the headquarters of its BDS segment from the St. Louis metropolitan region to the Washington, D.C. area by January in order for Caret and other senior company executives to increase in-person interactions with government customers. In a July interview with Defense One’s global business editor Marcus Weisgerber, Caret cited the company’s main priorities for pursuits that include the U.S. Air Force‘s future T-X pilot training jet, new intercontinental ballistic missiles and an aircraft for ground surveillance operations. Caret also told Weisberger that she aims to secure contracts from the Navy to update and extend the service life of the service branch’s Super Hornet fighter jets as U.S. production orders wind down. “It’s a great business and it’s one where I can really use our engineering talent and to keep it current and to continue to look at how we do those technical insertions that continue to differentiate these aircraft in the future,” Caret said of the fighter jet-related maintenance and upgrade work. She told Reuters in a separate July interview BDS has also prioritized commercial derivatives, satellites, human space exploration and autonomous vehicles for potential growth. Caret is 28-year Boeing veteran who has held various leadership roles at the company such as chief financial officer and vice president of finance at BDS, as well as VP and general manager of the firm’s vertical lift division, where she was responsible for tiltrotor helicopter, cargo and attack rotorcraft programs. She sits on the board of directors of the Center for a New American Security and serves on the council of trustees of the Association of the U.S. Army. Executive Mosaic congratulates Leanne Caret and the Boeing team for their selection to receive this award.